We provide on-site conditioning and aquatics programming at the North and South facilities of the Auglaize-Mercer Family YMCA. The equipment at these facilities allows for state-of-the-art conditioning, resisted therapeutic exercise, and functional return-to-play and work activities. Various populations can benefit from these individualized programs including athletes, workers, pediatrics, geriatrics, and deconditioned individuals. Treatments can be completed on a 1/1 basis or in a group; this is determined by insurance and/or by the therapist. Aquatic therapy consists of an exercise program that is performed in the water and is a beneficial form of therapy that uses the physical properties of water to assist in patient healing and exercise performance. The buoyancy provided by water decreases the amount of weight bearing and reduces the stress placed on the joints. The viscosity of water provides an excellent source of resistance that allows for muscle strengthening without the need of weights. These aspects cannot be experienced on land and are especially useful for patients with arthritis, geriatrics, total joint replacements, chronic pain, and bariatric patients. 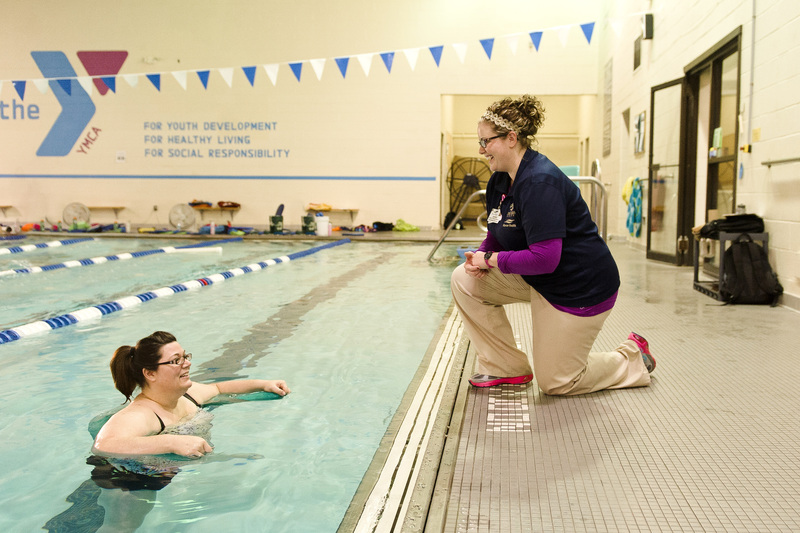 Our aquatics program is done in large pools that may include shallow and deep-water aquatic training; which allows us to progress patients of various heights from chest to waist deep water. The pools are equipped with a chair lift to assist patients that are unable to use the step entrance into the pool. Our conditioning program consists of strength-training and work conditioning. Our work conditioning program is strictly for patients who have been injured at work and is designed to assist them in returning to work. These patients perform work simulated tasks along with improving their overall strength and endurance. The strength-training program is usually a continuation of physical or occupational therapy from our outpatient clinics and patients can be challenged by using resistive/cardio equipment, balance equipment and stability balls.